We’re starting a new series today titled, It’s Not About You. Over the next few weeks we’ll take a look at the narcissistic side of modern spirituality and learn how our attitudes need adjusting. Drawing one from this series took longer than usual to get started, but came out simple and concise. If I asked you to define the attitude of American society using a single characteristic, what word would you come up with? Patriotic? Compassionate? My observations require a different adjective; entitled. Everyone deserves something. A raise, a vacation, a positive outcome to whatever situation. Of all the things we could feel entitled to, the one that reigns above all is answers. Answers to any question we can fathom, explanations for other people’s actions, reasons for our failure to receive some other thing we’ve “earned”. No matter who the question is directed towards, modern society stands vehemently static until we have this information. Heaven forbid the answer given is not the preconceived response we’ve determined the question deserves! In 2 Kings 5, Naaman nearly missed being healed from leprosy because he didn’t like his question’s answer. Naaman was a commander in the Syrian army and a leper. During a raid in Israel, a girl was captured and began working for Naaman’s wife. Learning of his disease, the girl compassionately encouraged Naaman to visit the “prophet of Samaria (a.k.a. Elisha)”, he would be healed. Naaman’s entitlement to healing begins. He pulls rank and has the king of Syria send a letter to the king of Israel, setting up a formal meeting between Naaman and the Israeli king, with the ulterior motive of meeting Elisha and, BAM! No more leprosy. The scheme unfolds as planned, until the actual healing process takes place. The king of Israel, upset that this diseased Syrian commander usurped his authority to get into his court, reluctantly agreed and Naaman’s date with destiny was set. Avoiding the normal pleasantries, the king sent Naaman directly to Elisha’s house. Bonus for Naaman! The meeting with Elisha, however, did not go as Naaman envisioned. Naaman expected some holy words and spiritual sleight of hand, a flash of burning magnesium would have been a nice touch. Instead, Naaman received some bathing instructions and directions to a less than desirable river to bathe in! In order to wash away his leprosy, Naaman had to submerge himself into the Jordan river seven times. Hearing this infuriated Naaman. Despite expressing his disappointment (showing his tail in front of Elisha) and offering cleaner alternatives for the location of this bath, Elisha calmly shuts the door in Naaman’s face and Naaman storms back to his entourage. His posse looks at him in bewilderment and says, “Seriously, dude? The guy just told you to take a bath to be healed and you’re mad because the water is dirty?! Naaman caves and takes a swim in the Jordan, coming out with skin “like that of a newborn”, completely healed. God calls us to tasks by planting in us a vision for a specific project and an insatiable passion to see it through. What often frustrates our efforts is our own hesitation as we wait for a popular Christian buzzword from God, confirmation. We continually ask God to reveal why He’s given us a passion to x,y,z and why we should follow through with our idea. Apparently, if we don’t know why we are serving in a particular capacity, the notion must have originated from a questionable source and following through would mean certain demise. Taking a meal to that couple who just brought home a baby and we only know as acquaintances may be awkward and ruin any chances of friendship since they did not invite us. Offering a cold bottle of water to the ragged man at the intersection on a sweltering July day may be offensive because his sign doesn’t mention being thirsty. The point of today’s drawing is we are asking the wrong question. God does not owe us an explanation. He’s worthy of our affection and obedience just because he’s God. An idea is the most resilient parasite known to man. Once an idea strikes, our question should not be why, but why not? I read this when you first posted it, and I’ve reread it a couple of times during the week until I’ve gotten some words together of my own. 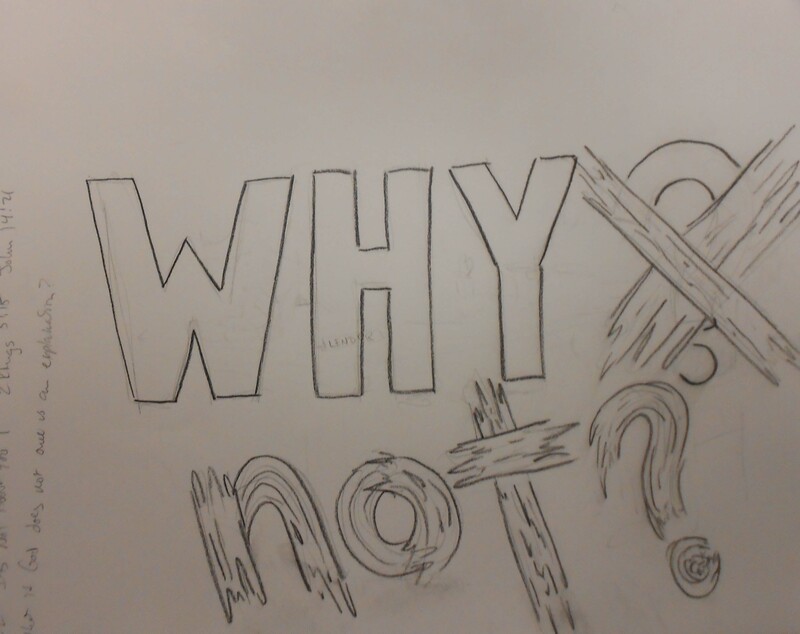 The question of “Why?” is particularly appropriate with the Colorado theatre shooting that happened this past weekend. The coverage in the news was very much like it usually is when things like this happen. Those left alive are asking “Why?” and demanding answers when there really aren’t any answers. I even heard one lady say in an inteview that if she found out that the “Why?” was that the guy who did that was insane that it wouldn’t be enough of an answer for her. I am sure that a good deal of her response was from dealing with the trauma, and I certainly don’t want to make light of anyone’s experience. I’m really looking forward to this series that you are working on. It has already caused me to examine myself for areas in which I need to grow. I’m glad this post is speaking to you and helping you grow! Thank you for sharing, John! I was very cautious when I prepared this post, in light of the Aurora incident. In no way, did I want to imply we should approach a tragedy like that with the attitude “why shouldn’t that happen?” When facing a tragedy, apathy (why shouldn’t it happen) is just as detrimental to the situation as overspiritualization (it was God’s plan). However, trying to figure out why it happened hinders the coping/grieving process. The proper reaction is to accept that it did happen and move forward with reconciliation/forgiveness/healing and anything else that needs to be done in light of the event. I am really excited about the rest of this series as well! I can’t wait for Sunday! On another note, I just completed a piece that will be on display during our next series. I ventured out into new territory this time and created project where the viewer has to interact with the piece, manipulating panels and curtains to experience the image. The piece is titled ‘Lose Your Religion’ and will be on display next month. I’m not going to post it on here until the start of the series, so I don’t spoil it for anyone. Be on the lookout for the big reveal! I’m going to be looking forward to the big reveal!